Over the last few years I’ve had the privilege of meeting a number of patient community organizers, managers, and innovators and despite the varied backgrounds, purposes, and methods used to make a difference in their respective community, almost all of their origins can be traced back to a single hashtag: #hcsm. Originally started by Dana Lewis in January 2009, the Healthcare Communications & Social Media (#hcsm) twitter chat is the standard that all other chats are (or at least should be) measured against. By my estimate, at least 20 other patient community twitter chats can trace some kind of origin to #hcsm participation. While Dana would be the first to say the numbers do not matter, and what she values and aims for is a stimulating conversation every Sunday from 9-10pm EST, I decided to look into how much of an impact a single hashtag can make on the world. In the interest of full disclosure, the first #hcsm chat was Sunday, January 18, 2009. Symplur began tracking #hcsm in earnest October 11, 2010. While the data presented isn’t fully representative of #hcsm, covering 71.38% (1,574 / 2,205 days) is more than enough for the purposes of a summary analysis. Unless otherwise noted, the data below has been calculated from October 11, 2010 through January 31, 2015. Since Symplur started tracking #hcsm, 1,067,644 tweets from 117,637 unique users have been recorded, generating a total of 5,570,381,350 impressions. I realize comparing #hcsm to other hashtags isn’t fair, #hcsm has the advantage of duration. For example, #hcldr started being tracked on October 12, 2012 and has generated 1,147,911,021 impressions and #bcsm has generated 1,079,493,037 impressions since June 28, 2011. But is the strength of a hashtag measured in its primary metrics, or its broader influence? Thanks to Signals, I can answer both questions. How Influential Can One Hashtag Be? I’ve looked through the (as of this post) 159 tweet chats Symplur is tracking and identified 20 likely chats that came as a result of someone participating in #hcsm and then creating something for their own respective community. Without talking with each of the tweet chat moderators, I can’t be absolutely certain, so I’m simply including chats that are a direct offshoot of #hcsm (#hcsmca, #hcsmanz, #hcsmeufr, #hcsmeu, #hcsmla, #hcsmuk), chats with sm included in their hashtag (#ayacsm, #bcsm, #btsm, #dsma, #gyncsm, #hitsm, #hitsmind, #lcsm, #mhsm, #nhssm, #spsm) and three other popular chats whose moderators are frequent participants in #hcsm (#hcldr, #medpsych, #meded). Since #hcsm has the longest running dataset in the Symplur database, I feel safe with the assumptions I’ve made. 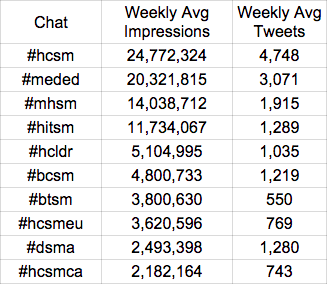 As these chats have existed over a wide range of time, I looked at the weekly average of #hcsm and its likely offspring and pulled the top 10 with respect to average weekly impressions for your enjoyment. Through Symplur Signals, I can run complex analysis on a list of hashtags, such as the 20 I’ve identified above. With respect to broader influence, these hashtags, these tweet chats, these communities that have likely come to be in one way or another because of #hcsm have generated a combined 16,785,417,203 impressions from 3,202,176 tweets. While the 117,637 cumulative users, 1,366 participants with more than 100 tweets, and representation in 217 countries is fantastic #hcsm participation data, I think 20 is the most impressive number. At least 20 different tweet chat communities exist, in part, because someone participated in a #hcsm chat and wanted to do more for their community. Of course this says nothing of the non-profit organizations, outreach and advocacy programs, and other patient-generated initiatives that owe some form of thanks to the #hcsm community for planting or cultivating an idea into action. This shouldn’t discount or discredit the amazing accomplishments of the other patient communities and their respective tweet chats. But I think it’s clear that #hcsm is more than just a hashtag, it’s a social movement. If you would like to look at the data used to support this post, this dropbox link is for you.